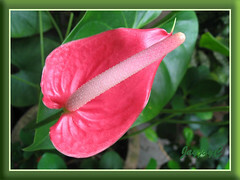 A beautiful hybrid of Anthurium andraeanum that has been in our garden since early 2006, presented by a friend. 3 lovely plants in a medium-sized pot that is located at the front yard porch and producing almost continually year round, gorgeous rosy-pink flowers to our greatest delight. Even when not in bloom, their dramatic green and heart-shaped foliage provide added beauty to our tropical garden. 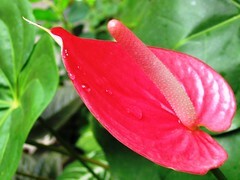 Features: Anthurium andraeanum is the top favorite of approximately 1000 species in the large genus Anthurium. In the wild, it grows as a veiny epiphyte with bright orange-red spathe in wet tropical rainforest. In cultivation, this species has been popularly hybridized for so many years, resulting in such varied sizes, colors and shapes. 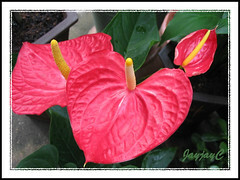 These cultivated hybrids are broadly classified as Anthurium x cultorum or A. andraeanum Hort. It is an evergreen perennial that can reach 1 metre in height and width, though most cultivated hybrids and varieties grow between 30-60cm. An upright plant that produces dark green leaves that are oblong and heart-shaped, varying in size from small and medium to as large as 30cm or more in length. Each leaf is held on a 30-60cm-long petiole. As the plant grows taller and yellowed leaves are removed, its stem become spindly and produces aerial roots for support. However, most of the cultivated varieties have compact growth habit instead and suckers freely. 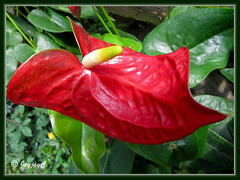 A. andraeanum is well-known for its spectacular show of vibrantly colored spathes (bract-like leaves) that come in various shades of red, pink, purple, orange, yellow, white, green and even bi-color. 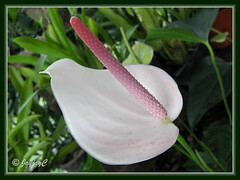 Though mostly heart-shaped, size and form of these attractive spathes are as different too. They are held on erect peduncles that are as long as the leaf petioles or exceeding them to display handsomely above the foliage. They have a blistered or puckered texture and a shiny surface as if lacquered. Each spathe bears a protruding fleshy and tail-like spadix that carry the insignificant cluster of true sessile flowers. 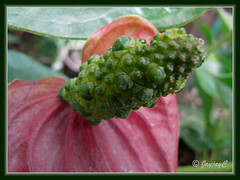 Once pollinated, the spadix will produce berries which will contain the seeds that can be used for propagation. However, berry-bearing spadices as shown in the right images are rare. 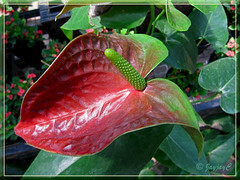 Know more about anthurium pollination/seeds and pollination in aroids at Exotic Rainforest’s site. Spadices can be of the same or contrasting color as the spathes, in white, yellow, orange, pink, dark purple/maroon, red, green and combination of colors, more often changing during its growth and development. 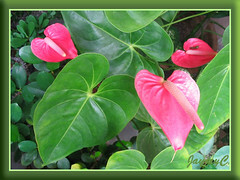 Anthuriums bloom more or less continuously year round and flowers are long-lasting, about 6 weeks at a time. A. andreanum contains toxic calcium oxalate crystals (raphides) that upon ingestion will cause painful irritation of the mouth and throat, resulting in blistering, dysphagia and hoarseness. Culture (Care): An easy-to-grow ornamental plant that needs little attention, preferring the warm, humid and wet tropical conditions. Light: Outdoors – bright indirect light or filtered sunlight to partial shade for best growth and increased flowering. Keep away from direct sunlight that causes scorching or misshapen leaves. Indoors – bright light and sufficient warmth too. Though it tolerates low light or full shade, its growth may be retarded, leaves become distorted and flower production may cease or be greatly lessened. Moisture: Water moderately and regularly. Soil need to be kept moist but not waterlogged. It enjoys high humid conditions. So provide adequate humidity by either misting the plant regularly or stand potted houseplant in a saucer of pebbles filled with water almost to the base of pot. Soil: Prefers a sandy loam medium that is humus or organic-enriched and can retain moisture, yet drains well and is well aerated. Others: If grown as houseplant, place it where it gets sufficient light, warmth and provide humidity by regular misting for optimum growth and flowering. To maintain tidiness, remove old discolored or yellow leaves and wilted flowers. Keep the foliage shiny, healthy and free of dust and mites or other pests by regularly sponging with water. Feed monthly with a flowering houseplant fertilizer at half-strength. If plant grows too tall above the pot and look unsightly with aerial roots, prune off the top crown and repot. 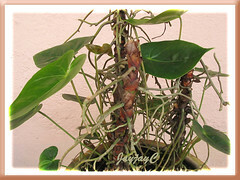 Divide and repot when plants are pot-bound or congested with overgrown suckers, probably every 2-3 years. Beware of spider mites, mealy bugs, aphids, scales, slugs and snails. Propagation: By seeds which are rarely available. Commercially, it is done by tissue culture. For the gardener, the easier methods of propagation are by stem cuttings, layering and division of offsets or suckers that sprout laterally from the base of the plant. By cuttings: When the plant has grown too tall with leggy stems, cut off with a sharp knife the top crown of stem that includes its leaves and replant it into new potting media. Leave the remaining lower portion of the stem as is in the pot and with regular care, it will develop plantlets all along the nodes and even offshoots from the base. Allow these young plants to mature and produce their own roots before severing them from the parent trunk to pot them individually. 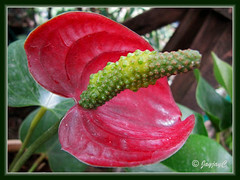 Update April 15 2009 – learn how-to propagate Anthurium by stem cuttings here. 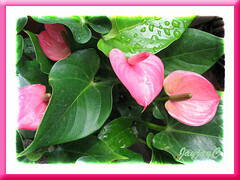 Update Feb. 22 2013 – learn how-to propagate Anthurium by division here. 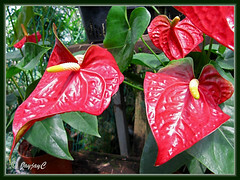 Usage: Anthurium andraeanum or Flamingo Flower will make impressive ornamental plant indoors, in greenhouses or conservatories, and as a decorative plant for homes, offices and shopping malls. Excellent as a container plant and in raised planters. It can be used as a landscape specimen, mass-planted in garden borders or as groundcovers. Its strikingly beautiful flowers are popularly used as cut flowers in floral display due to its longevity in water. Commercially, A. andraeanum with its wide range of exotic colors, has become the most popular export product as cut flowers and pot plants for countries like Netherlands and United States (Florida and Hawaii). 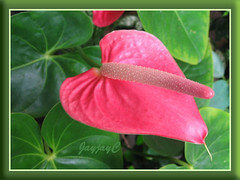 – TopTropicals, presenting awesome images of Anthuriums in exotic colors, and here for some extra information. Corrected! Thanks for taking the trouble to notify us of the typing error, Paula! Much appreciated.